Excellent pie and chips, stroganoff could've done with a bit more rice though!! Great pub for Sunday lunch though, ales not sampled but plenty of locals enjoying a Sunday pint or five. Busy in the car park, with plenty of tw4ts parking 4x4 across two spaces...! Went here on Monday evening to meet up with a group of friends. Very nice pint of KT20 though Fullers and Youngs was available. Friendly competent staff and the burger I ordered was well cooked and tasty. Would certainly go again. Located on the Dorking Road in Tadworth. 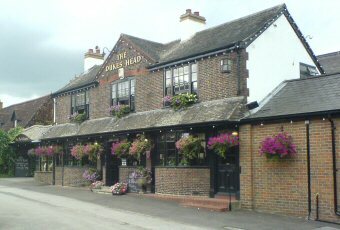 A large car park wraps itself around the pub with the beer garden, which is partly covered in the middle. The bar is along the length of the pub on the left. It has 6 real ales including one special for the pub. The lounge which curves around the bar is well laid out and comfortable. It was doing a good trade on food but I wasn't eating so I can't comment on the quality. I read tacky s review before I went to the Dukes Head with my Daughter and family, and would like to say that we had a perfect evening, the choice of drinks is very good, especially the beer, food was good and the staff friendly, I did have to ask for something to be changed, and this was done without fuss, and to my surprise was also taken off the bill, so I have no complaints, only praise, I think if tacky who wrote the review below had done the same I'm sure he would have been a lot happier, instead of letting it fester for 3 weeks before remembering to write his review. The food was one of the worst I've ever had, although staff was nice and beer was ok. We ordered a beef burger and a steak pie for lunch on 19 Nov 2011. The burger bun had strange burns, stone-hard surface and was very dry inside, all typical of badly defrosted food by microwave. The beef pate was again hard and dry, and broken inside the mouth like a biscuit. The pie pastry was as bad as the bun, and the blocks of steak inside tasted worse than canned corned beef. Steamed veg and chips also appeared frozen, so the only fresh ingredients were new potatos and salad, which were good. All others must have been low-quality ready-made supplies, frozen possibly for months before being defrosted quite unskillfully. I would not complain if I visited a pub randomly and was just served frozen food there. However, if it was of appalling quality even by the standard of pub food, I need to mention. At least they should remove their big sign outside boasting 'fresh food served all day'.